I love risotto, like with a passion. 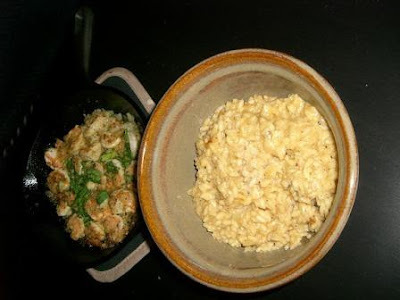 This past Sunday I was craving some sort of shrimp scampi, but I had no desire to leave my house so I thought I can make a sudo shrimp scampi paired with a white wine risotto…it wasn’t exactly shrimp scampi, gasp – I had no garlic in the house, but it was close enough to fulfill the craving, and the risotto was the perfect compliment to the shrimp. Peel and devein the shrimp, season with salt, pepper, lemon pepper, and garlic powder. Place in the fridge to marinate about 30 minutes. Pour the chicken stock in a sauce pan and bring to a simmer. In a large sauce pan, melt 2 tbl of butter over medium heat, when the butter begins to foam and brown add ½ cup onion, and cook about 3 minutes, until soft. Add the rice and stir to toast and coat with the butter, add the wine and simmer until the liquid has almost evaporated. Add ½ C of stock and stir until almost completely absorbed, continue adding stock ½ C at a time, stirring until almost completely absorbed before adding the next. This will take about 20 minutes, but might not use all the chicken stock. Cook until rice is tender but still firm to the bite, once this is achieved remove from the heat and add the parmesan cheese and season with salt and pepper. While the risotto has about 10 minutes left pull the shrimp from the fridge. Heat a small cast iron skillet over medium-high heat with the garlic and lemon olive oil, add the other ½ C of onion and cook until tender about 3 minutes. Dredge each shrimp in the bread crumbs and add to the hot skillet. Cook about 3 minutes on each side until they are curled. 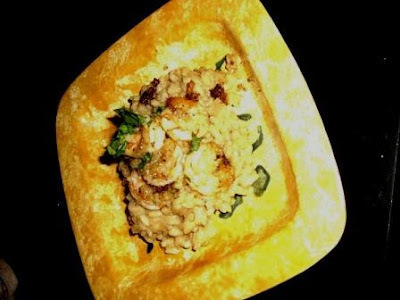 Serve the shrimp in the cast iron skillet and the risotto in a separate bowl or plate a mound of risotto with several shrimp on top. This meal may sound a little complicated, but it really isn’t. Yes you need to stir the rice regularly, but this is easy to do while dredging and preparing the shrimp. And if plated individually, it looks quite fancy – you can use it to impress that special someone without using a lot of ingredients or spending a lot of money. Tip: buy shrimp in 1lb frozen bags at grocer. They are cheaper this way than buying from the counter, and since they are fresh frozen they taste just as fresh when defrosted in the fridge (which only takes about an hour). Additionally, you can pull a handful out for a quick meal for one or an appetizer for a few unexpected guests!